I was twelve when I first read The Giver by Lois Lowry, and then reread it again recently when the fourth book in the quartet came out. It’s one of my favorite dystopias, so I was intrigued—and alarmed!—by the movie version. I went to see it mostly out of curiosity, and while it wasn’t perfect, I was pleasantly surprised by how well it was done. The book and the movie both tell the story of Jonas, who lives in a community where all of life is carefully ordered and arranged by a ruling council of elders. When Jonas comes of age, he is assigned the role of Receiver, to receive the memories of a time before the community. Jonas’ time with the old Receiver, now dubbed the Giver, and the memories he receives, open his eyes (almost literally) to the world around him. You’ll notice I didn’t specify at what age Jonas “comes of age”—in the book he’s twelve, in the movie I believe he’s seventeen. There was a lot of hubbub about that when the casting was revealed, and I had some reservations too. It worked better than I expected. Coming-of-age at twelve seems like it should be entirely different from that experience at seventeen…but perhaps Jonas is a young seventeen? At any rate, it felt more true to the book than I expected it to. The major significance of the age difference seems to be in Jonas’ relationship to his female friend. In the book he merely notices an attraction, while the movie turns it into a budding romantic relationship. But I can see how that’s much easier to portray on screen, and since it only went as far as hand-holding and chaste kissing, I don’t feel like it strained the original story or feel too much. And since it did allow Fiona to have a bigger part, that was a nice benefit. My favorite thing may be how the movie handled colors. Jonas’ community is entirely colorblind, essentially living in a black and white world. 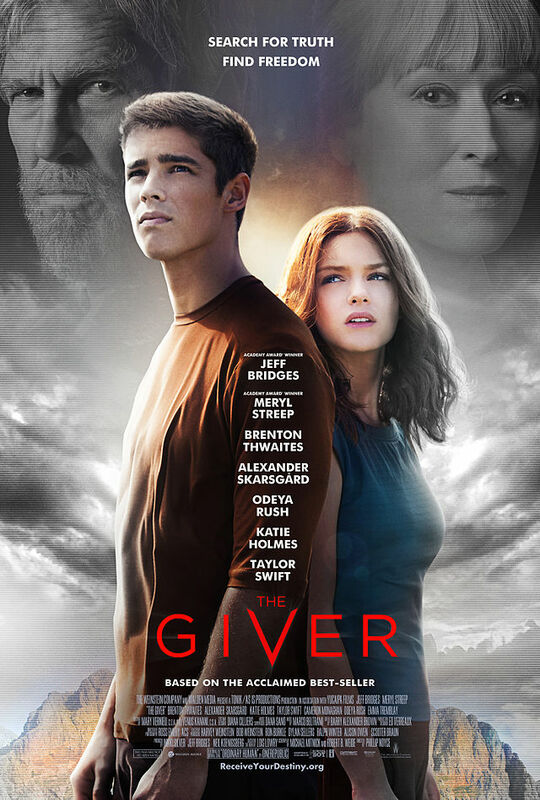 The movie opens in grays, punctuated by vivid color in the Giver’s memories—and gradually gains more and more color as Jonas sees the world differently. The movie did well presenting the concept of the world, and I think it was true to the characters. What they didn’t capture so well (and frankly, I don’t know how it could be conveyed) is the deep-seated creepiness of the entire society. I remember when I read the book at twelve, it didn’t turn disturbing for me until Lowry revealed what it really means when someone is “released” from the community (which I’m trying not to spoil here…) When I read it again as an adult, it became clear something was really, seriously wrong within the first page. The movie, to some extent, reverts back to that less complex view—the community becomes creepy once we understand their most heinous act. In the book, the “release” is only the (arguably) worst effect of a system that is deeply oppressive on so many other levels already. By the end of the movie, it began to paint the Elders, and particularly the Chief Elder (notably played by Meryl Streep), as villains in the story. Part of what’s deeply disturbing in the book is that the Elders are not evil. They genuinely believe they’re acting for the best for everyone—that their horribly dystopic society is the perfect utopia. I have to say also that I’m not sure why the movie is rated PG-13. Apparently it’s for “a mature thematic image,” and my best guess is that refers to, well, “releasing” people…which is disturbing, but is also extremely close to the depiction in the original children’s book, written for 10 and up. I wouldn’t rate the movie G, but I’d probably give it a PG. The Giver is a subtle, deceptively simple, incredibly layered book. The movie presents perhaps the top two or three layers, and doesn’t manage to get at all the ones underneath. But I will say that what it presents, it presents well. It’s a good movie, a compelling story, and a reasonably true retelling of a book that (despite its brevity) is nevertheless much larger. I’d recommend the movie—but absolutely recommend reading the book afterwards. Pre-Order The Storyteller and Her Sisters! I do think it’s hard for a movie to do a good job with a book–but they’ve been doing better in recent years! Maybe the filmmakers finally figured out that the qualities that make a book popular will also be good on screen…instead of changing everything! Yes, the best thing about this movie (well second best, because Jeff Bridges) was the use of color. It was all gray and the very first full color shot we see is that full-on spectral sunset. It just made the whole thing all the more vivid and dazzling when contrasted with 30 previous minutes of black and white… I just started crying. And then I could not stop. I cried for most of the rest of the movie for one reason or another. At the end… oh I was crying so hard and making ugly faces trying not to make noise. I wouldn’t say it was a particularly good movie, you know? To me it was pretty average, and especially when you’ve read the book, seeing how things translate from book to screen can be disappointing. I certainly experienced that, what with the ‘evil elders’ and trying to make it an action flick (I sort of expected it, actually, as well as the small romance. But if they were gonna’ do it, I’m glad that’s all it was). But I mean it just made me cry so much, I was in awe. Wow, that’s interesting that an “average” movie still had such a strong emotional resonance. Clearly something about it really struck you! The use of color was so impactful. It’s good to read some more positive thoughts on the movie! I was really wary of all the changes, but I’ve seen pretty positive responses to them. Not sure if I’ll be able to catch it in theaters, but I’ll definitely check out out sometime. Interesting that you would actually give the movie a rating making it suitable for more general audiences than the review board did. Must be that “thematic elements” thing. The story does sound pretty heavy for younger teens and pre-teens, but if the book was aimed at children 10 and up, it should be fine for them, too. I like your recommendation that viewers should absolutely read the book, too, after seeing the movie. People don’t do that often enough.